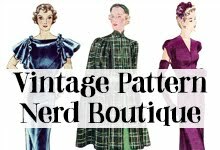 Congratulations to the lovely Kitty Ann for winning the pattern giveaway! 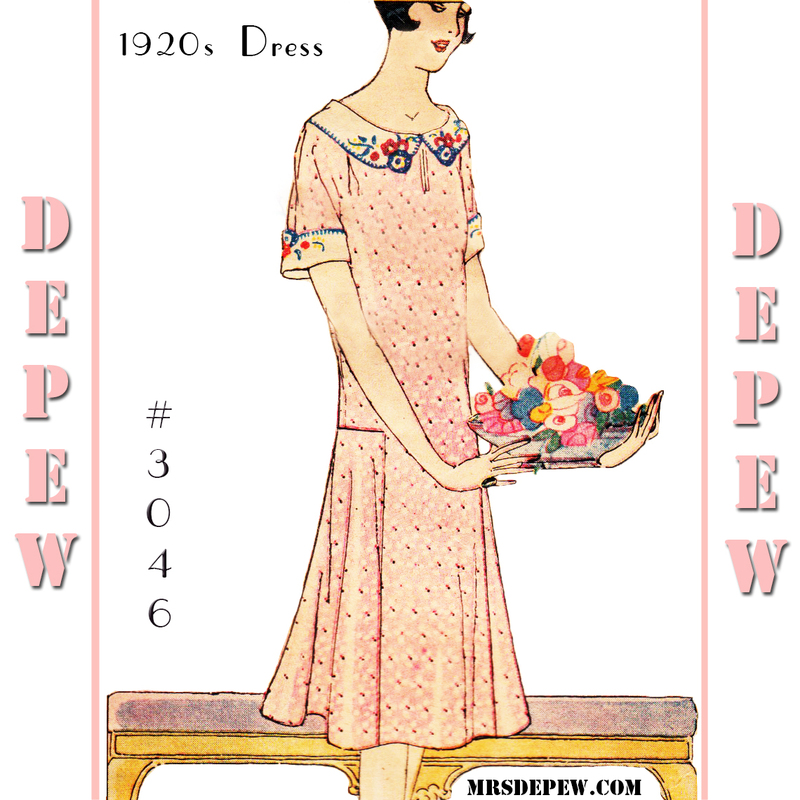 The prize was a copy of Depew #3046 1920s dress pattern. 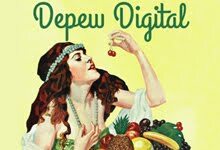 If you didn't win, here is a coupon code for 15% off at MrsDepew.com that will run this week and expire on April 17th. 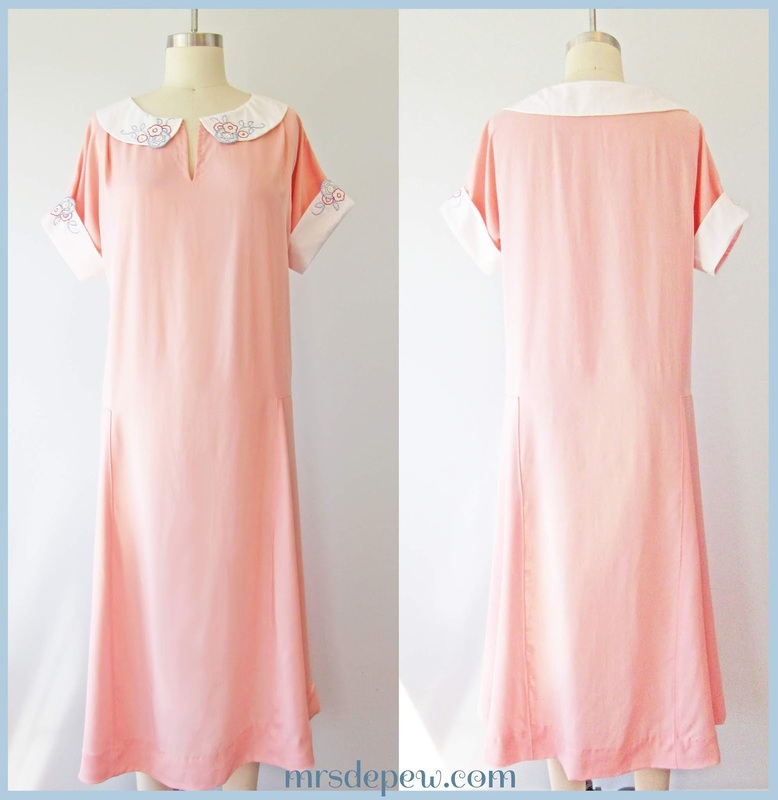 A 1920s Dress with Embroidery Using Depew #3046 and a giveaway! Today, my darlings, I am celebrating the fact that I have finally finished my 1920s dress with embroidered cuff and collars. This one sat unfinished for over two years as we moved to Georgia, remodeled our house, and dealt with me being seriously ill for a year. Now I'm slowly getting a bit better and working some more, and I have tackled some much-missed sewing! The pattern I used is my favorite Depew reproduction of all time, #3046. And yes, love, this is a giveaway post! 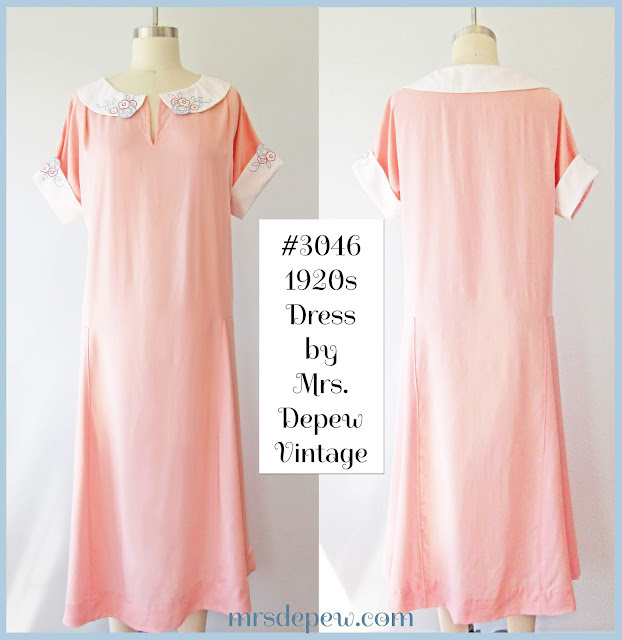 Depew #3046 reproduction 1920s dress in multisize! But first, can I just show off a bit? I'm super happy with how the dress turned out! The pattern goes together really easily and the most time-consuming part is probably that gently-flared hem. I used a beautifully drapey rayon from Jo-Ann fabrics in the closest color (coral actually) I could match to the original envelope art. The rayon made pressing a perfect hem a bit tricky. Embroidering the cuff and collars was by-far my favorite part of sewing this little gem. They are nice, crisp white cotton that I had left over from my Ikea fabric shopping days in Norway for my Picture Perfect Apron Pattern. The shoulders have small tucks that are concealed underneath the collar instead of using bust darts, which weren't quite common in 1925. And the sleeves are so easy because they are cut-in-one with the dress body. Side skirt inset panels can look tricky at first but the best way I have found, is to turn seam allowances on the panel, press, and flat fell the panel right onto the skirt. This dress is perfect for the intermediate sewist, or a good bridge from beginner to intermediate for someone who is looking to learn more and expand their skill. Frustratingly, it no longer fits me because I lost 15 lbs when I fell ill.
How about you? Have you ever made a 1920s dress? 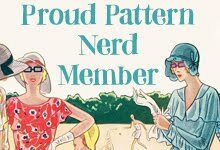 Do you have a favorite pattern? Would you like to win a free multisize pdf copy of this one? 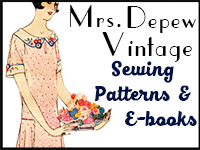 To enter to win, answer below with your favorite pattern from www.MrsDepew.com. For an added entry, you can do any of the following. Just leave a comment below to let me know which you've done (honor system!) so that I can add your name to the hat the right number of times. 2. Follow A Few Threads Loose on Facebook. 3. 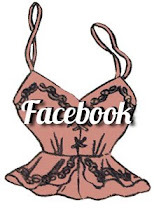 Follow Mrs. Depew Vintage on Facebook. 4. 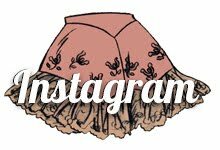 Mention this giveaway on your blog, Instagram etc or share it on Facebook. For those of you that hadn't already noticed, I have a huge thing for the 1920s. 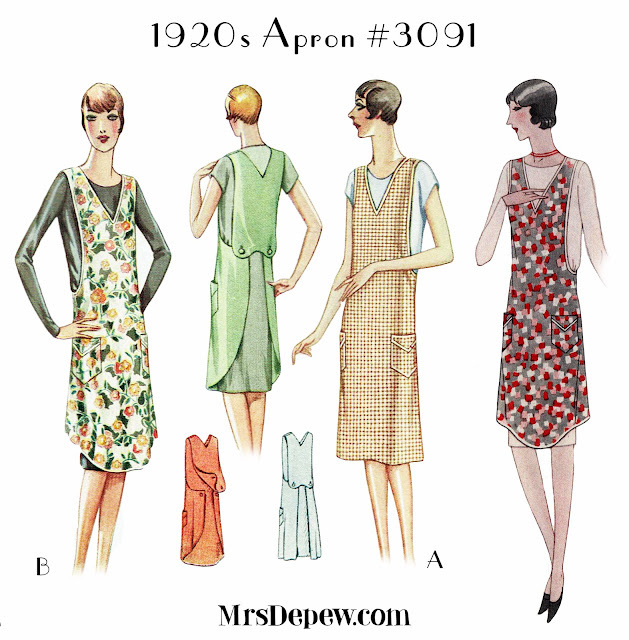 1920s aprons, in particular, are a passion of mine and I'm currently sewing my way through some of my apron pattern collection. This time I used Depew#3091 which is a repro of an original. For the fabric, I picked up a pre-cut two-yard length of cotton by Waverly (a steal at Walmart of all places!) and it was the perfect amount for a propper full-coverage "canning apron" (as my mother called them). So without further ado, here is my canning apron! The neckline uses an inverted binding technique. It really does provide a lot of coverage which is great for messy jobs. 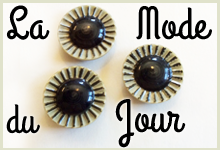 The buttons I used on the back are large vintage mother-of-pearls that came from my late mama's stash. A tip if you make this one. Stitch your buttonholes in the back BEFORE you bind the edges. If you use a buttonhole foot like I do, the buttonholer will catch on the binding and you will get some really messed up buttonholes. How about you? 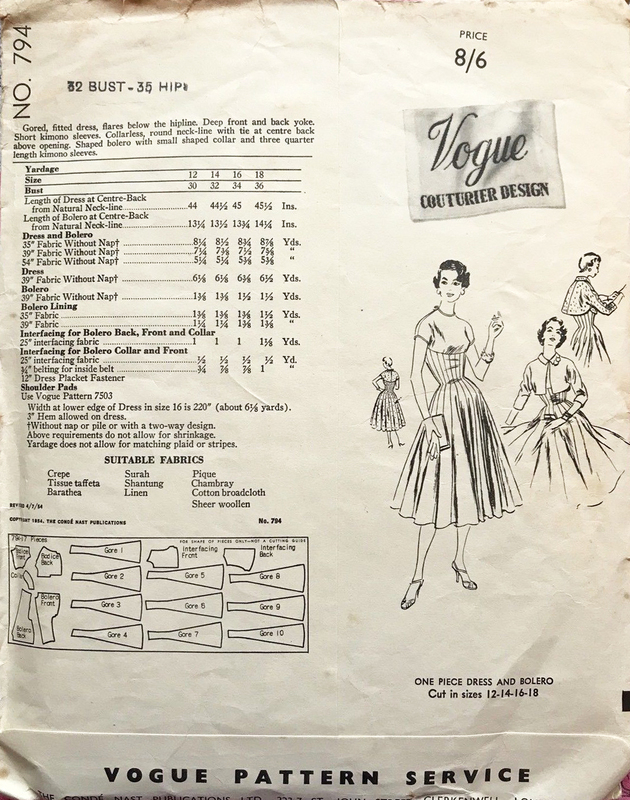 Have you ever sewn an apron before? Do you have a favorite apron that you just can't do without? 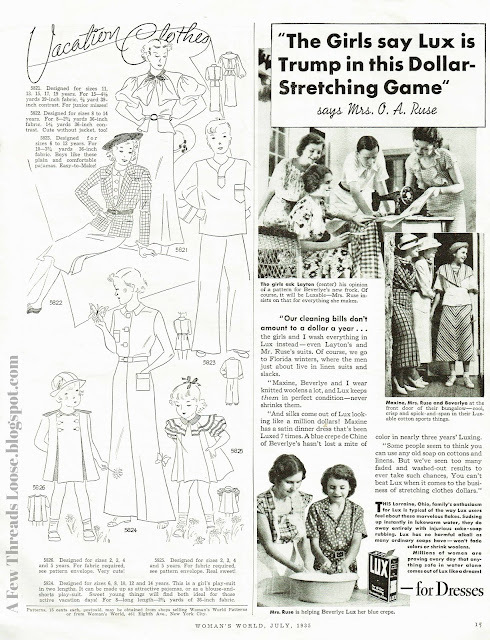 The Use and Abuse of The corset - A 1909 Delineator Article By Charlotte C. West, M.D. Today my darlings, I have found for you a fascinating article about the proper and improper use of corsets. 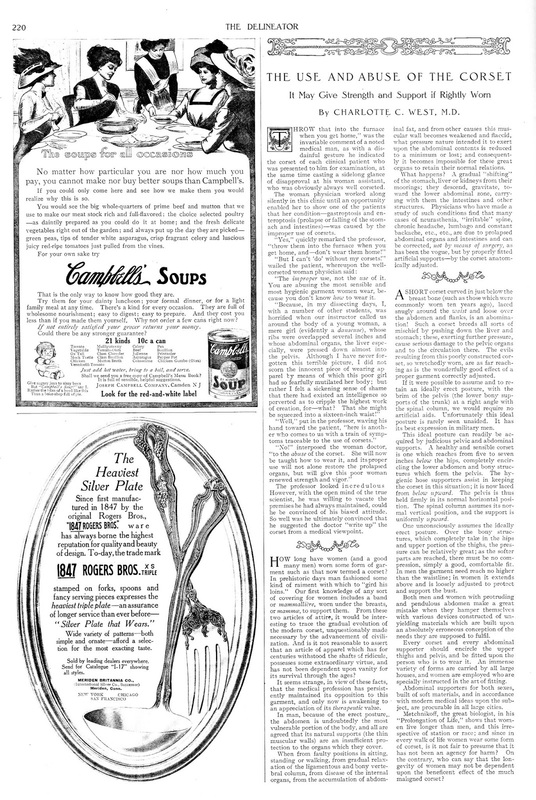 This article comes from my collection of Antique Delineator Magazines. 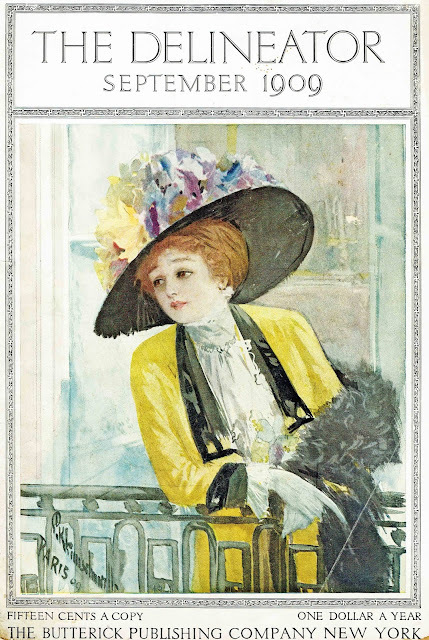 The September 1909 issue of the Delineator Magazine. 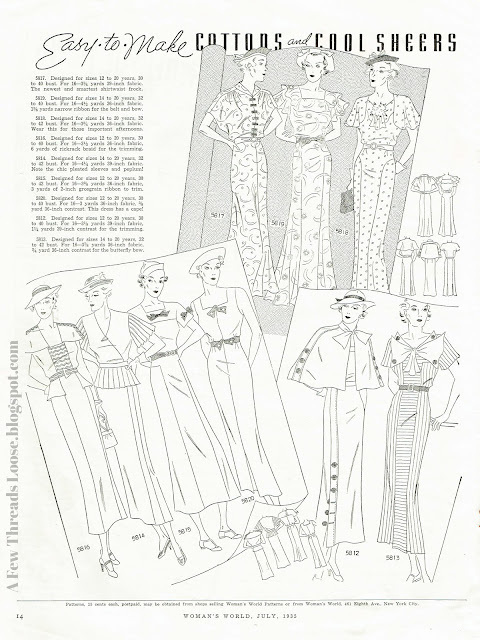 It was originally published in the September 1909 issue of the Delineator Magazine (as produced by Butterick) and I have transcribed the original for you to save your eyes from evil small-print. 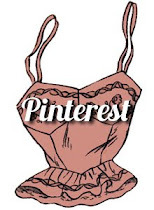 It gives an interesting medical perspective in favor of the corset from the viewpoint of a female M.D.! By CHARLOTTE C. WEST, M.D. "THROW that into the furnace when you get home," was the invariable comment of a noted medical man, as with a disdainful gesture he indicated the corset of each clinical patient who was presented to him for examination, at the same time casting a sidelong glance of disapproval at his woman assistant, who was obviously always well corseted. The woman physician worked along silently in this clinic until an opportunity enabled her to show one of the patients that her condition-gastroptosis and en­teroptosis (prolapse or falling of the stomach and intestines)-was caused by the improper use of corsets. "The improper use, not the use of it. You are abusing the most sensible and most hygienic garment women wear, because you don't know how to wear it. Today for you I have some scans from a sweet little edition of Woman's World Magazine. 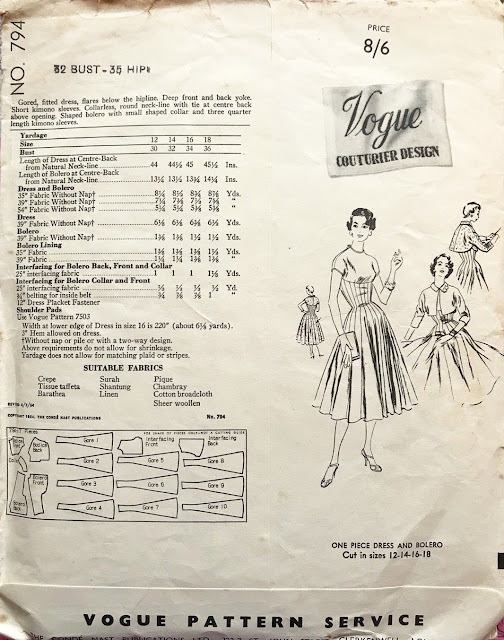 They offered a small selection of mail order sewing patterns and the illustrations were charming enough to merit sharing. 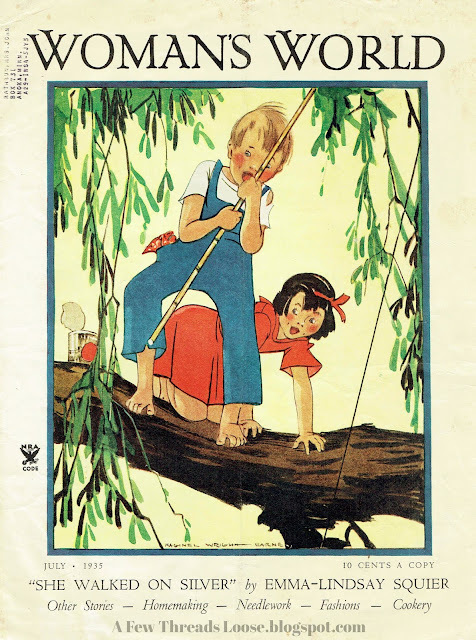 This particular issue is July 1935. 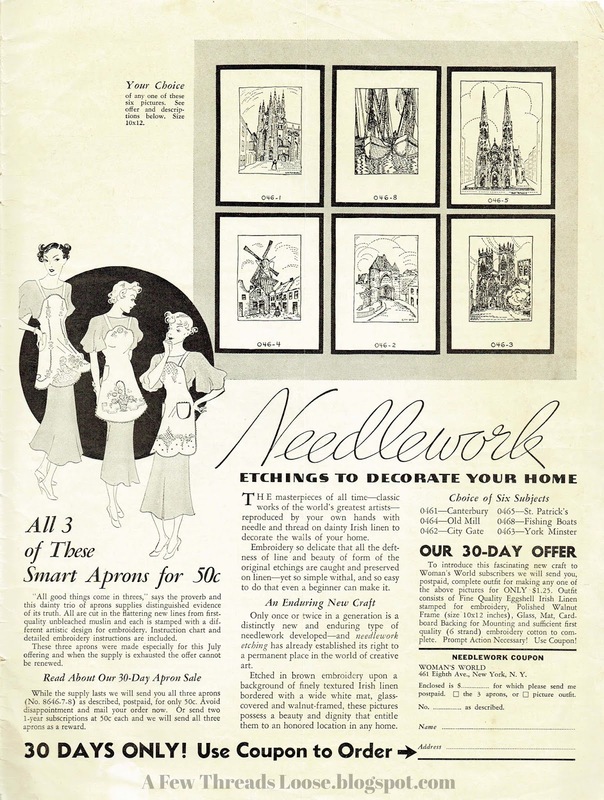 July 1935 Woman's World Mail Order sewing pattern ads. Don't you just love all of the details that have gone into the bodice designs? Bows, capes, button trim and pleats galore - what fun! Notice that even the fashions for young girls have larger shoulder details reminiscent of the women's clothing designs above. July 1935 Woman's World Mail Order design ads. Sew Expensive... Vogue Couturier 794 and her many, many gores. 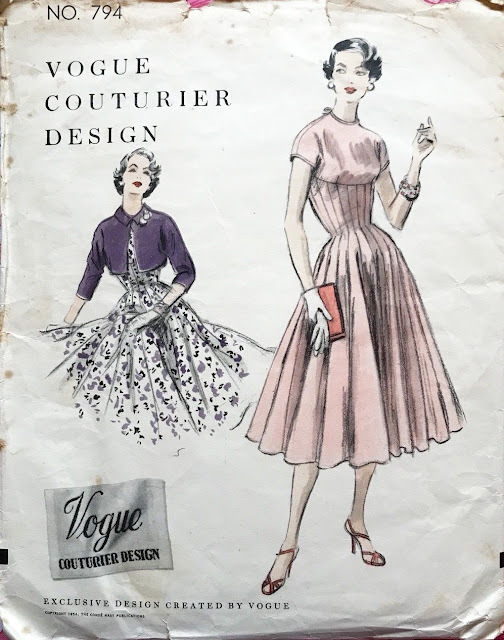 Today for you, I have a rather interesting pattern from 1954 for you to study. Vogue Couturier No. 794 has made it onto our Sew Expensive list due to both sale price, and because of a few unique design details. Image courtesy of Ebay seller Vintage-Newsstand. 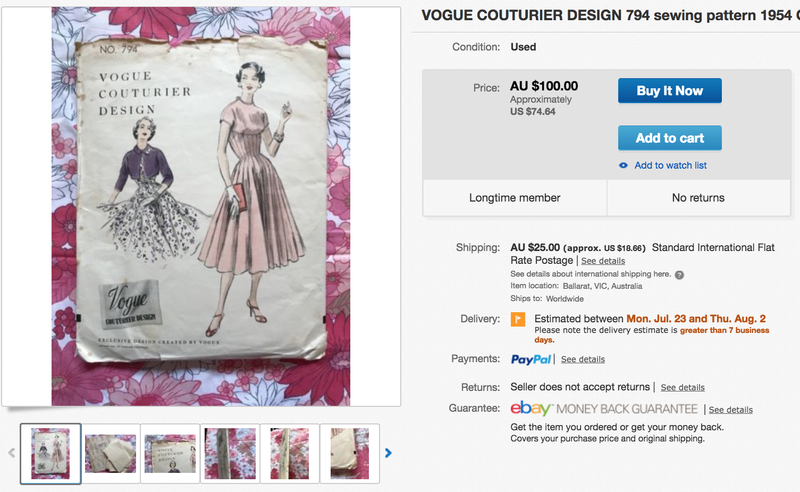 This lovely little kimono-sleeved Vogue 794 sold recently on eBay for $100 Australian Dollars, or about $74 US Dollars. Auction.Image courtesy of Ebay seller Vintage-Newsstand. The true cost however, may need to be calculated in hours of your life spent making it. 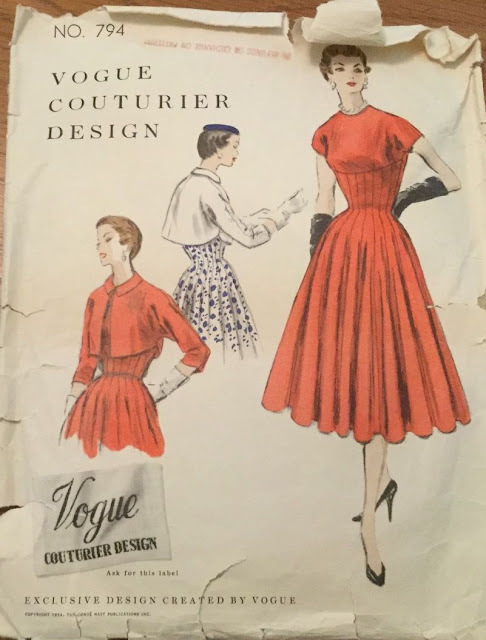 First, painstakingly cutting out the 10 jaw-dropping skirt-gore pattern pieces, cut on a double fold of fabric and then sewing together the resulting 20 (yes, 20) gored skirt/ bodice pieces. God forbid you should line it as well. 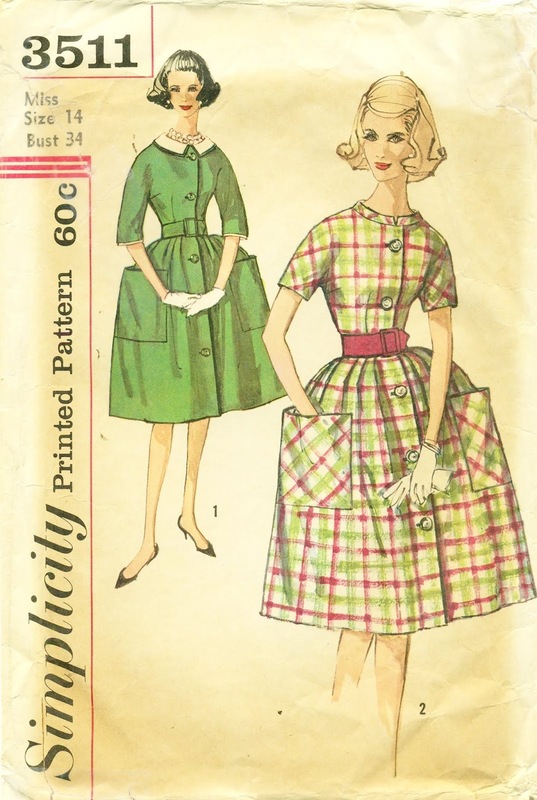 Interestingly enough, this pattern also has different art and coloring released the same year. The above is likely the British/ Australian release, the latter is likely the US release. Image courtesy of eBay seller Peddecord. How about you? Would you devote your time to such a brave undertaking? Have you taken on a project like this before and lived to tell the tale?